Do you like tinkering with settings? We thought about you too. System Utilities allows you to create custom cleaning profiles that best suit your needs. Our slick user interface makes it easy to accomplish common tasks while providing guidance and information all the way. Using an application like this shouldn't require any advanced knowledge. We designed it so that anyone can use it. If you need help with anything, we have our experts standing by round-the-clock. For beginnersQuickly launch in-depth cleans without having in-depth knowledge. Safety firstUsing a very large programs database, System Utilities makes sure that only obsolete entries are deleted. For advanced usersExperienced users can customize the cleaning processes according to their needs. Import and exportRoll out your custom configuration to any computer you want. One clickYou are never more than one click away from running a scan. It's never been easier than this. 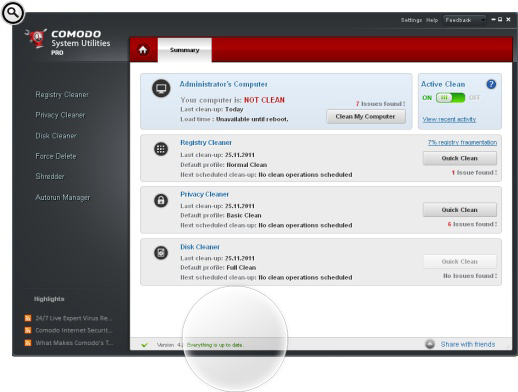 CustomizableMake System Utilities dance to your own tune by creating personalized cleaning profiles. Non-intrusive alertsDiscreet reporting of issues on your computer which can be handled at your convenience. Streamlined & task orientatedOur interface doesn't just look good - it's the result of thousands of hours of usability testing to make sure you accomplish what you want, fast! 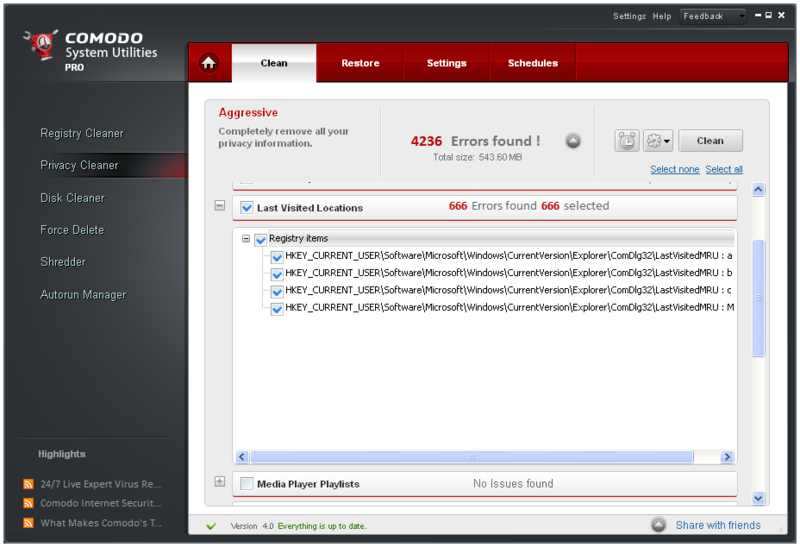 100% safeOur SafeDelete™ and Registry Protection technologies mean you can always undo changes if problems occur. Active cleanNo need to use the 'Clean' button. 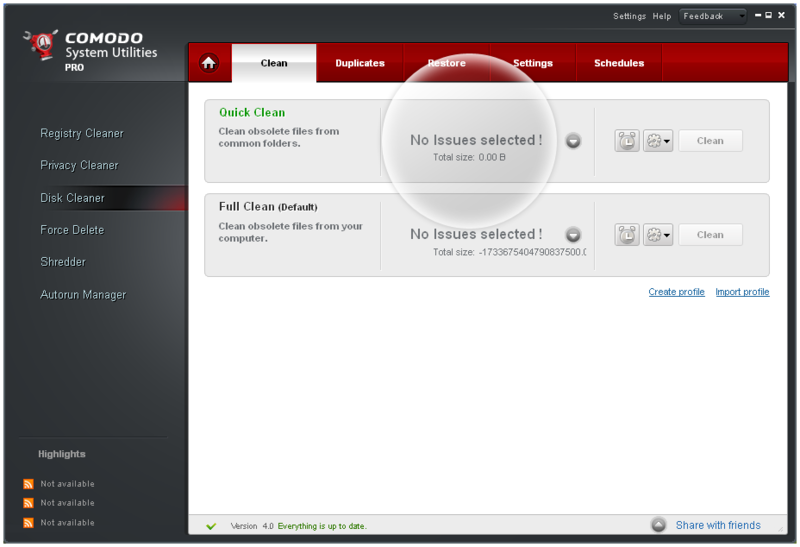 'Active Clean' identifies and fixes registry errors as a background service. Instant scanningBy constantly monitoring files and registry activity you get to see results without having to click 'Scan'. High detection ratesComodo's huge database of known applications means we identify an unrivalled number of obsolete registry entries. 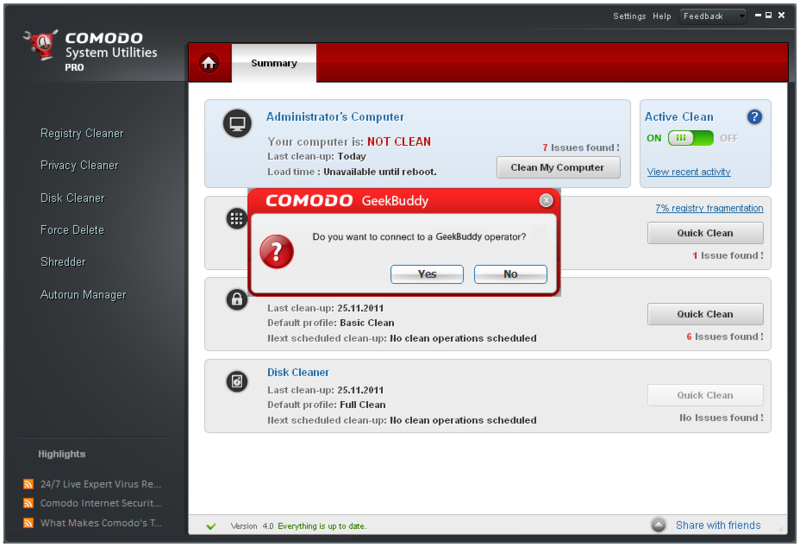 Leave no tracesUsing the new and powerful privacy cleaner, you can make sure your privacy is not compromised. 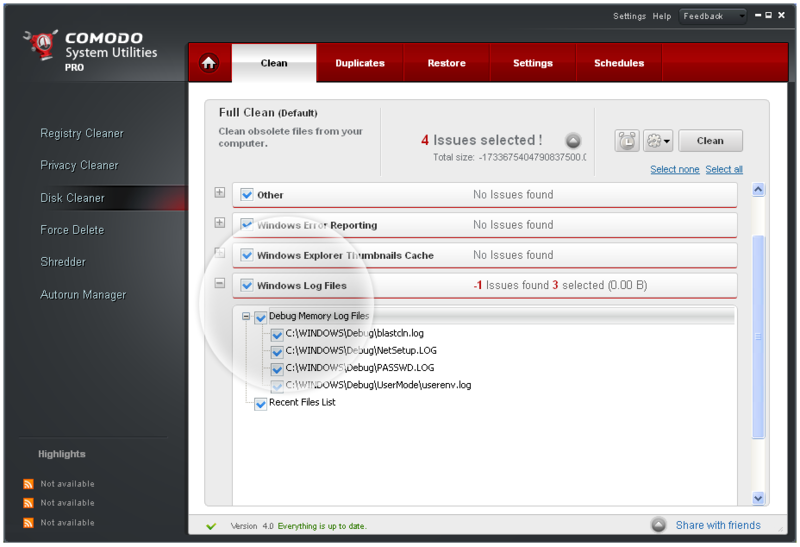 Keep your PC cleanApplication leftovers and files or registry entries are removed with minimal user intervention. Remove junk filesAll the files that you don't need are automatically removed to save you more disk space. 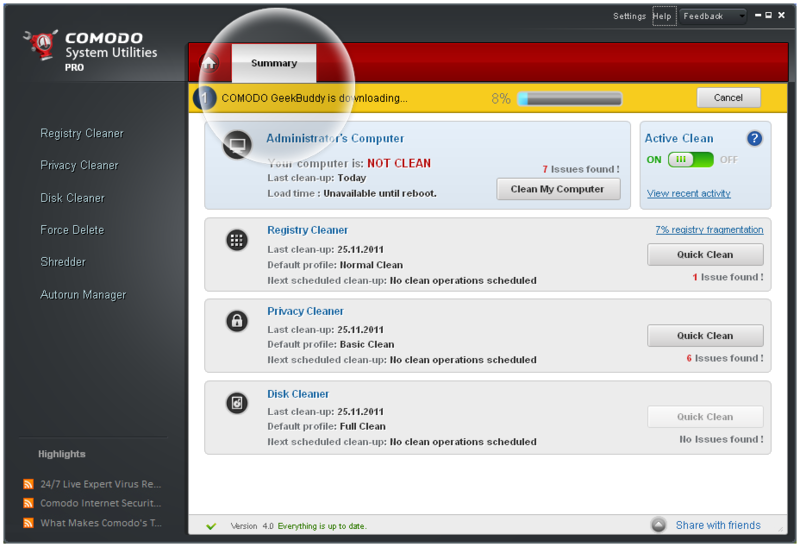 Continuously cleanSystem Utilities keeps your computer in a perpetual state of optimization by fixing errors in real-time. 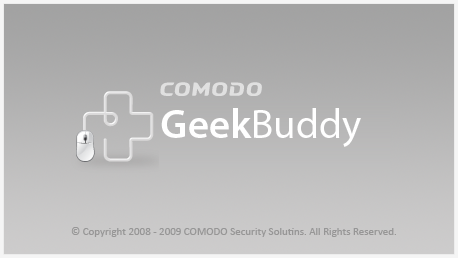 Help me get startedRight after installation, just click the 'GeekBuddy' icon to have an expert configure the software for you. Free! 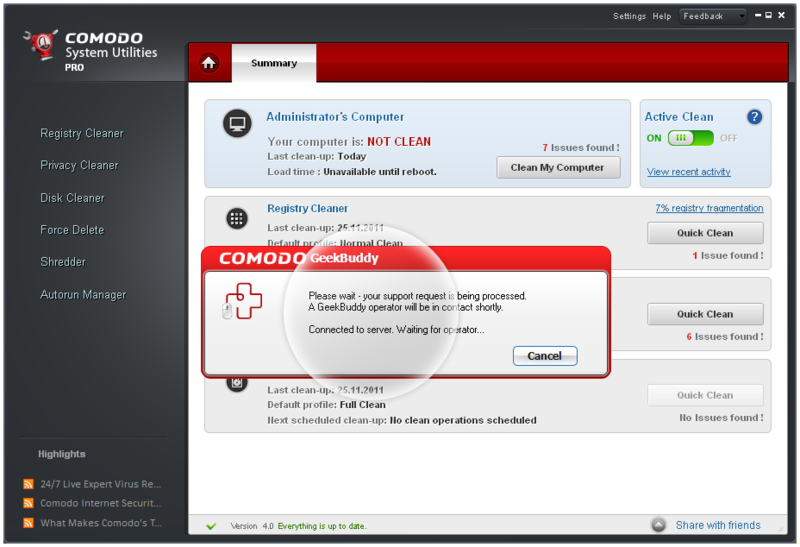 With you all the waySystem Utilities, like all Comodo products, features comprehensive support options. 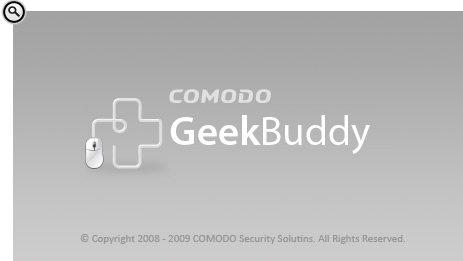 24/7 availabilityOpen GeekBuddy's IM style interface at any time and you'll be connected straight to a support operative. 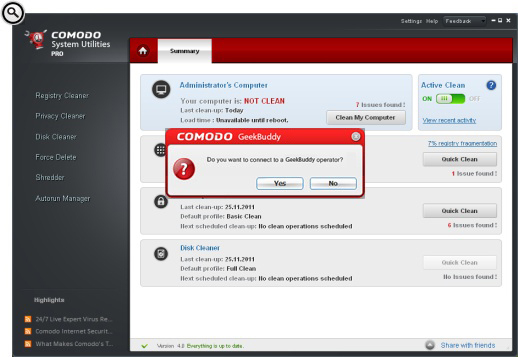 GeekBuddy for freeEach Pro customer gets GeekBuddy free for 60 days. It's like having your own computer expert by your side, 24/7. Take a look at what else you get with this extraordinary software. 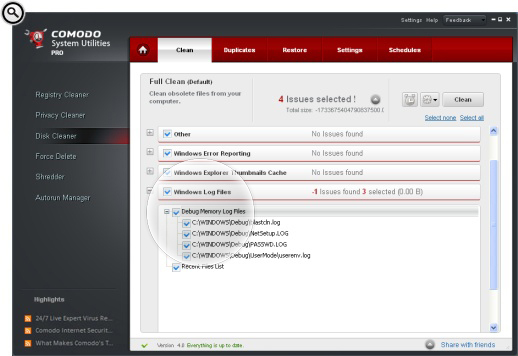 Flexible scheduler allows you to specify individual Registry, Privacy and Disk cleaning scans to run at times that suit you. No need for a user manual. Our interface is so simple that everyone can take advantage of this powerful software within minutes. Our permanent file eraser is compliant with Department of Defense standards that ensure data you delete cannot be recovered by anyone. Searches your computer and finds all duplicate files, even if they are saved under different filenames, freeing up disk space and removing needless clutter. By using our SafeDelete™ patented technology, you can immediately restore files that were removed by the previous cleaning process. 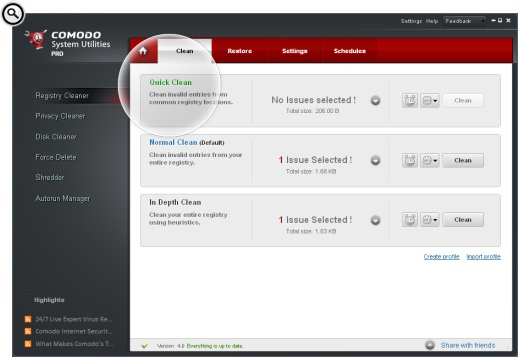 During a cleaning process, some valid registry entries might be removed by mistake. 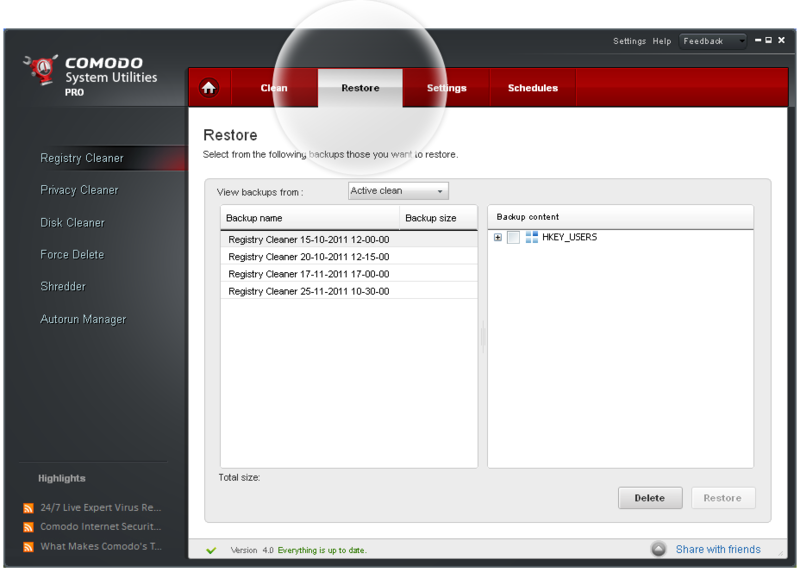 Our patented registry protection technology lets you restore them with ease. Ever see the message 'Windows cannot delete/move this file because it is being used by another process'? 'Force Delete' allows you to have the file automatically removed after the next restart. Over time, the file structure of the registry becomes disorganized and inefficient. The Registry Defrag tool improves performance by compacting the registry back to optimum condition. Makes it easy for you to choose which programs and services are loaded at Windows startup - helping further improve computer performance by eliminating unnecessary items.